AMCK도 동참하려는 의도에서 비롯된 것입니다. 그리고 등 아래, 엉덩이, 꼬리는 모의 길이가 길어진다. 여름에는 모의 길이가 짧아지거나 밀도가 낮아진다. 특히, 암놈인 경우는 새끼를 출산할 경우 더욱 이런 현상이 뚜렷하다. Black and White는 다시 2가지로 분류될 수 있습니다. 왜냐하면 밝은 색의 속털 때문이다. Seal and White는 다시 4가지로 분류될 수 있습니다. Gray and White는 다시 3가지로 분류될 수 있습니다. Sable and White는 다시 2가지로 분류될 수 있습니다. (1) CAP : 머리와 귀의 윗부분에 모자를 쓴 모양이다. 대개 모자가 앞이마의 중앙에까지 온다. (2) GOGGLE : 고글을 쓴 모양이다. (3) BAR : 코에 막대가 있다. (4) EYE SHADOW : 연한색의 새도우가 있으며, 고글과는 구별해야 함. (5) STAR : 이마에 흰점이 있음. (6) BLAZE : �L과 이마에 흰색이 뻗어 있음, 폭과 길이는 상관없음. (7) CLOSED FACE : 얼굴에 별다른 마킹 구분 없이 다싸고 있음. (8) OPEN FACE : �L이 머리를 싸고 있으며 별다른 마킹 없음. (9) FULL MASK : �L과 고글과 바가 다 있음. (10) MASK : 9)번에서 바만 없음. 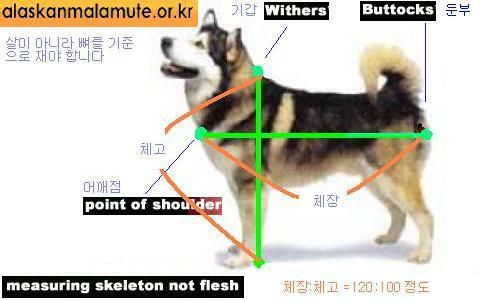 기갑(withers)까지의 길이에 해당되는 것이 좋다. 보통은 땅바닥에서 어깨까지의 높이의 반은 가슴이고 반은 다리의 길이다. and soft. The undercoat is dense, from one to two inches in depth, oily and woolly. to medium along the sides of the body, with the length of the coat increasing around the shoulders and neck, neck, down the back, over the croup and in the breeching and plume. Malamutes usually have a shorter and less dense coat during the summer months. The Malamute is shown naturally. Trimming is not acceptable except to provide a clean cut appearance of feet. 11)Color:The usual colors range from light gray through intermediate shadings to black, sable, and shading of sable to red. Color combinations are acceptable in undercoats, points and trimmings. The only solid color allowable is all-white. White is always the predominant color on underbody, parts of legs, feet, and part of face markings. A white blaze on the forehead and/or collar or a spot on the nape is attractive and acceptable. The Malamute is mantled, and broken colors extending over the body or uneven splashing are undesirable. Black guard hair with black or dark grey undercoat. Black or black tipped guard hairs with white or cream undercoat. but is not a true black because of the light undercoat. Gray guard hairs with a light gray, cream, or white undercoat. No red factor is evident. Dog definitely appears gray, even though there may be some black hairs on the topline. and eye color. No black factor evident. Black or gray guard hairs with a reddish undercoat and red trimmings. Both black and red factors evident. Light gray guard hair with white undercoat. Both guard hairs and undercoat are white. Often evidence of a mask in cream color. the center of the forehead. (2)Goggles: Dark areas under the eyes and extending sideways to the cap. (3)Bar: A dark area extending from the center point of the cap down the nose. (4)Eye Shadow: Dark markings under the eyes but not extending out to the cap. (5)Star: A small white spot in the center of the forehead. (6)Blaze: A white mark extending from the center point of the cap back up the forehead. Width and length can vary. (7)Closed Face: Dark coloring covering the face with no distinct markings on the face. (8)Open Face: A cap covering the top of the head and no other markings on the face. (9)Full Mask: The combination of cap, goggles and bar. (10)Mask: The combination of cap and goggles. 11)The lighter streaked "snow nose" is acceptable. Siberian Husky (Kolyma River Region), and the Eskimo dogs of Greenland and Labrador. the deepest point being just behind the forelegs.